More work birthdays mean I get even more use out of my You're My Hero set! This time for a firefighter! I also used Border Banter, Sent with Love (both retired), Hearts a Flutter and a chevron from the new thinlits card dies (worth a look! I'll post some photos later on of cards I made with them) to add some layers. I cut the truck out with the exclusive new deco label framelits as well. A little embossing with white ep on white craft ink added some more texture. Last but not least, though you can't see it here, I used the letters in the ABC-123 Sketch set to put his name on the envelope. That's one of my favorite things to do, and with two coordinating sets, it's easy to do just sketch filler, just outline, or combine them in any color for the perfect match to my card! While I'm tooting my own horn, you'll notice I didn't credit a CASE on this one. That's because this is another card that I built from scratch with nothing to go off! 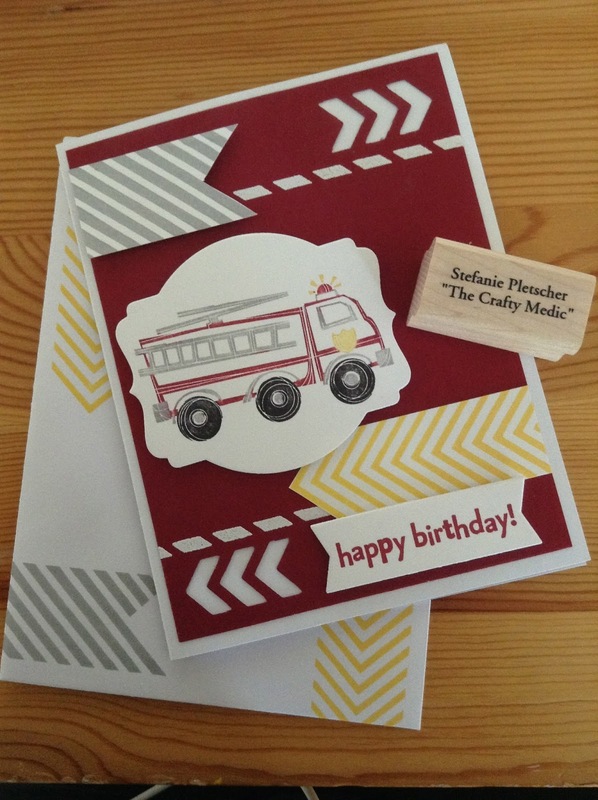 I just knew I wanted these colors, chevrons and the fire truck and went from there! I often ignore my own best advice and don't have a stash of sympathy cards ready to go. This was one of those cases. I needed one quick (I'd actually put it off until a few minutes before I had to go), so why not bust out a new technique I'd never done before? 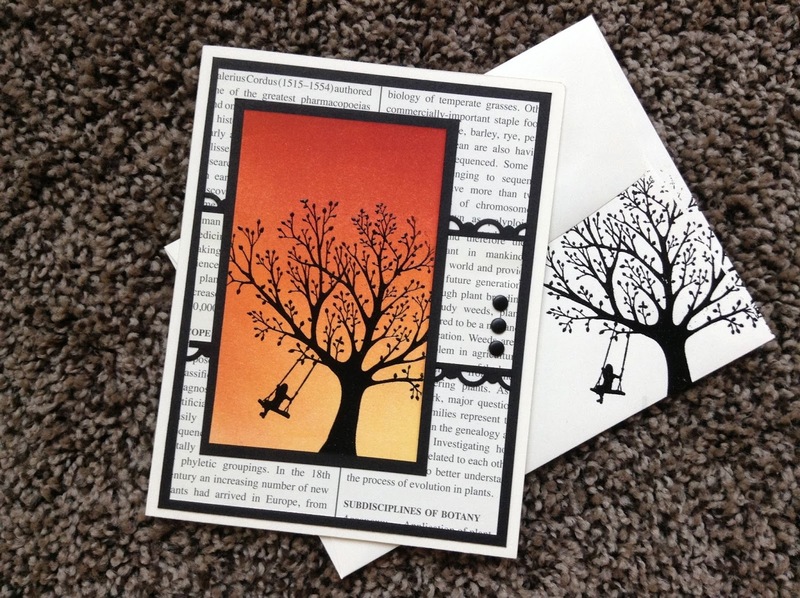 I CASEd this card from Mel Sharpe, and played with my brayer to make the sunset effect. Some black embossing (on the card and the envelope) and some candy dots and we're out the door! If you'd like some free candy dots (available in all four of the core color families), email me today to find out how! Unfortunately I've been spending too much time IN ambulances and not enough time STAMPING them. But another of my ambulance pals is having a birthday, so I saw no excuse to not make another themed card. This time around I almost exactly CASEd Tanya's card. I didn't have any chevron ribbon though, so I substituted the flag from Hearts a Flutter instead. 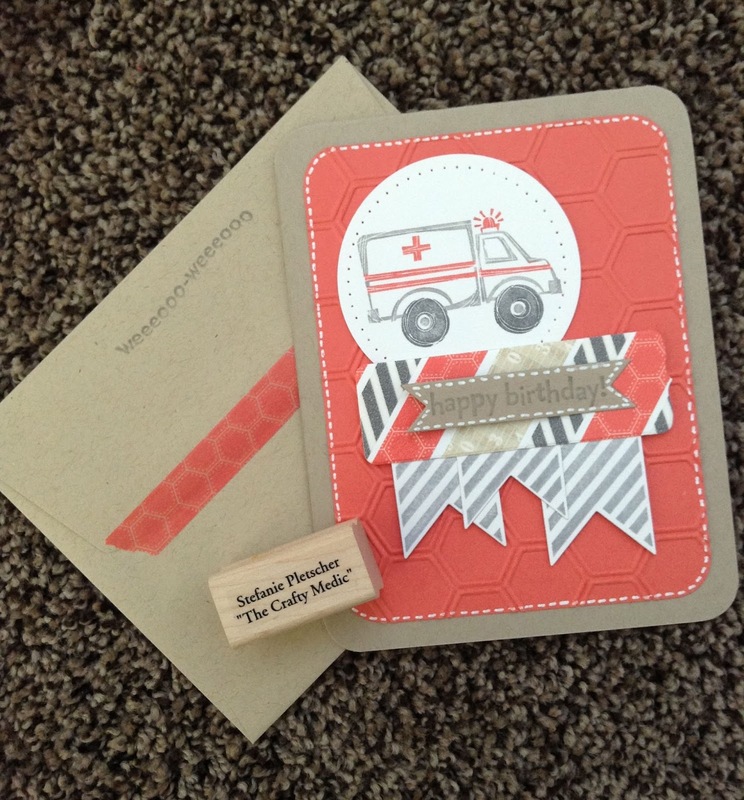 Framelits, the magnetic platform and washi tape made this card come together no problem! I can definitely see myself making more of these! I hate to admit it, but I rarely just sit down and come up with my own design. Which is a little sad considering I went to school for design... but that's another story. I knew I wanted to use the Six Sided Sampler bundle, but none of the cards I could find to CASE were exactly right, so I made my own! 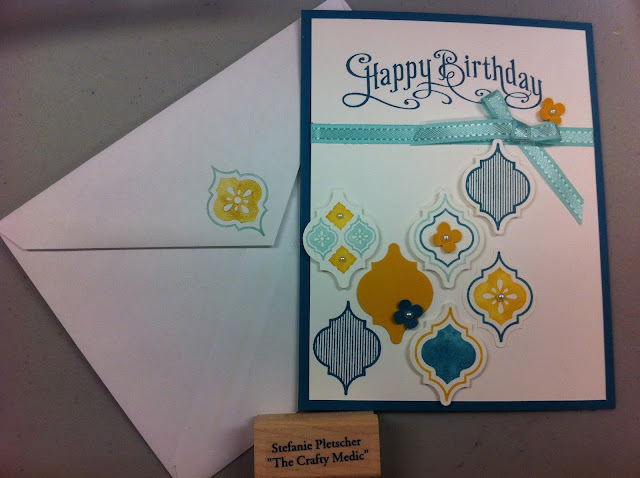 I also gave it a bit of extra dazzle by using retired shimmer paper for the stamped portions. A few pearls as a finishing took and I'm happy with it! When I left, I didn't have time to clean up after myself and ended up just throwing some random stuff in as well. Eeks! So needless to say my project when I came home was to start cleaning up my craft room (luckily the rest was reasonable). One of the first things I did was tidy up this shelf, because it makes me smile. I like having my single stamps (or at least some of them) out and handy, so I took them out of their cases and on display. I also displayed some cards I'd received from my uplines and others. I still have more cards to put out (and some stamps to track down), but it's coming along! The post its are notes from the insides of cards, which is a great idea so people can reuse a card you send them. They keep the note and pass on the card! Last but not least do you notice how nicely my clear and wood mount stamps are getting along on the next shelf down? So nice to finally be able to have them all handy and in the same place! I love this bundle. Even when I don't have access to my Big Shot and can't use the embossing folder, the stamps and punch make for a great modern, graphic, card for any occasion. I used markers to ink up the stamps in Pool Party, Island Indigo and Crushed Curry (my new favourite 'new' colour), added a pop with some left over ribbon from SAB and some pearls for bling. I forgot to take a photo of the inside, but it got a bit of stamping too. I made both these cards from My Paper Pumpkin kits. The one on the left is made pretty much according to the instructions in the June kit, and the one on the right is made with the Welcome Kit (the first kit that everyone gets, which includes your clear block) and some odds and ends from other kits. With convention last month, there was lots of exciting announcement. One of the big ones, that I'm excited about, is the chance to get a 50% discount on the first two months of any new My Paper Pumpkin subscription started by the end of August! Click here to sign up now, and use the promo code "PUMPKINDEAL" before the end of August to get it! Make sure that I'm listed as your demonstrator and you'll get some other goodies too!